When Tim Burton's Batman was released onto an unsuspecting public in summer 1989, the effect was a cumulative wake-up call: this was the path all superhero flicks would follow from now on. Forgoing the campy Adam West-led buffoonery of the 60s TV show, Burton's typically introverted, macabre style (although it was unfamiliar back then) rendered Gotham City as a lushly decadent twilight zone of conflicting architecture and ever present shadow. This approach would also extend to the characters. Although Jack Nicholson's overbearing, hilarious Joker stole the limelight (and most of the promotional focus), it was Michael Keaton's Caped Crusader who was the dark, beating heart of the piece. Brooding and insular, he was surely less showy than Nicholson's villain but symptomatic of Burton's constant obsession with the outsider, a theme that would crop up again in Edward Scissorhands and others. Talking of outsiders, the final genius to put his own unique touch on the film was composer Danny Elfman. Although he'd composed Burton's wacky Beetlejuice and Martin Brest's comedy Midnight Run the year before, he was then best known as front man for alternative group Oingo Boingo; Batman was his first venture into a big-budget arena and expectations were high. To say Elfman exceeded them would be an understatement; Batman is an enormously confident and powerfully Gothic work, one that belied his sparse years in the industry. 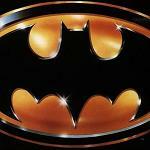 Everything from the classic opening march (reportedly conceived on a plane journey taken by the composer) to the inventively quirky orchestrations and the full throttle action sequences finally awakened audiences and filmmakers to the notion that superheroes could be taken seriously in musical form. This isn't to say Batman is pompous; far be it for Elfman to compose in a po-faced manner, his music is at once bracingly dark and sensibly tongue-in-cheek. Yet the sound defined in the film, at once cavernous and inventive, operatic and muscular, would influence every subsequent superhero score, from The Shadow to Spiderman and beyond. The principal feature, of course, is the classic Batman Theme itself, modelled on Bernard Herrmann (the composer admits it himself) but brimming with a brooding, exciting energy that makes it a joy to listen to, be it your first listen or your hundredth. The theme is prevalent in most tracks on the album but never at the risk of overexposure since Elfman always uses it in different ways, most enjoyably twisting it around the action music where it has any score fan punching the air in delight. Many tracks play around with unusual percussive and acoustic effects, lending Batman's first appearance in "Roof Fight" a somewhat unsettling edge before a blast of the main theme reinstates his heroism. The other principal theme introduced in the album's first half is a delightfully macabre waltz for The Joker, first heard in "Kitchen, Surgery, Face-off", one that leaves the listener grinning at the conjured up images of Nicholson cavorting around in a purple suit. 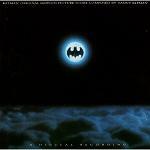 There are also some almighty exciting action sequences in "First Confrontation" and "Batman to the Rescue", the former mixing a tempestuous rumbling piano with building horn effects, while the latter showcases the Batman theme in its loudest, most thrilling context yet, accompanied by all sorts of orchestral carnage. Yet the main intention of the early stretches is broadly to convey a sense of mystery and frequent edginess as Batman's tortured hero and The Joker's marginally less tortured villain circle each other, hence the jumpy, unusual rhythmic patterns in pieces like "Clown Attack" and "Roasted Dude". 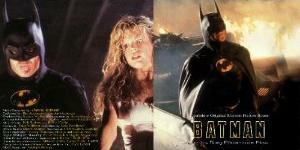 "Childhood Remembered" is an especially haunting piece full of dark choral work as Wayne recalls his childhood trauma, while the terrific "Descent into Mystery" utilises vocals in a far more charged, operatic environment, careering towards a stunning climax where Kim Basinger's Vicky Vale is shown the bat cave for the first time. Pitted against such orchestral ingenuity, it's hardly surprising that Elfman's "Love Theme" (for Wayne and Vicky) is less than memorable, although it does oddly weave in Prince's "Scandalous", presumably as a marketing attempt. Instead, the main highlights come towards the climax, a 20 minute power-house of thunderous action, dark-hued romanticism and full blown triumph. "Attack of the Batwing" is a masterpiece of action scoring, a full throttle attack from the massed orchestra as our hero swoops down on Gotham, a stunning achievement for a composer as young as Elfman was. "Up the Cathedral" introduces a huge organ to create a cavernous, intoxicating sound entirely appropriate for Burton's vision before "Waltz to the Death" sees the amusing Joker theme get its fullest airing. "Final Confrontation" then re-introduces the jumpy, jittery action music as the showdown between Batman and The Joker takes place high above the streets of Gotham; a solemn music-box rendition of the villain's theme sees the track out, perhaps indicating that he's had the last laugh... But of course when the Batman theme rings out in rapturous, celebratory style on brass and bells in the magnificent "Finale" one is left in no doubt who is the hero of the hour, perfectly complimenting the stunning visual element of the Dark Knight gazing out over the city. There's then a closing reprise of the central theme with minor variation in the orchestration, prepping us for the sequel. When people talk about composers defining a sound, examples rarely get more apposite than Batman, one of several defining works by a composer whose voice was one of the most exciting to emerge on the film music scene in the late 80s. Along with the skipping strings and ethereal choir combo of Edward Scissorhands, the quirky bombast of Batman marks Elfman at the top of the his game, one of the most influential soundtracks in the history of the medium. This classic soundtrack should be in everyone's collection and can be found at Amazon.co.uk in the UK, or Amazon.com in the US.